Description: Fire Chief A. G. Walden and Assistant Chief A. S. Brownewell in Fire Marshall's Office in Central Station. The location was William Street between Market and Main. Keywords: People, government, public services, interior, furniture. 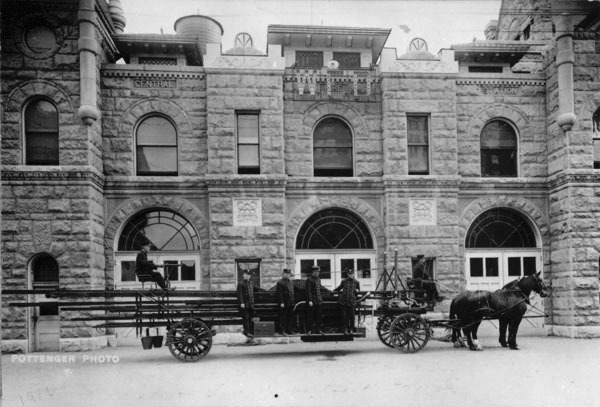 Description: Looking south at Central Fire Station, 109 East William. Located to the east of Wichita’s City Hall, the Romanesque Revival architectural styling blended with that of the City Building. Keywords: Government, public services, street scenes, transportation, horse-drawn fire wagon, firefighters, firemen. 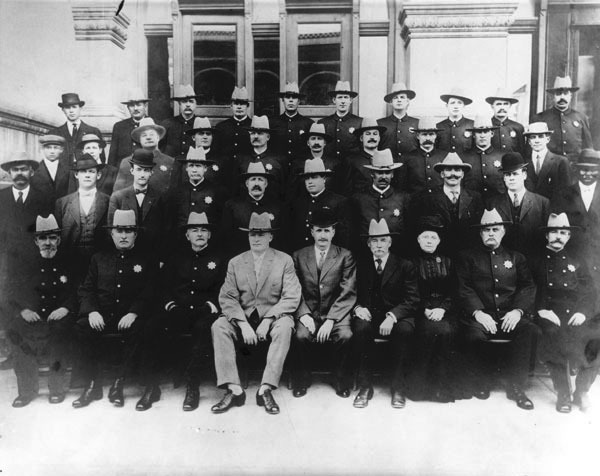 Description: Wichita Police Officers praised by Former President Theodore Roosevelt. 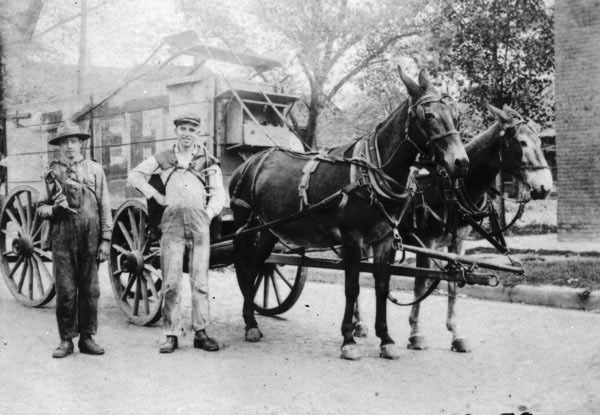 Photo taken on the steps of the Post Office, located on the northwest corner of Market and William. 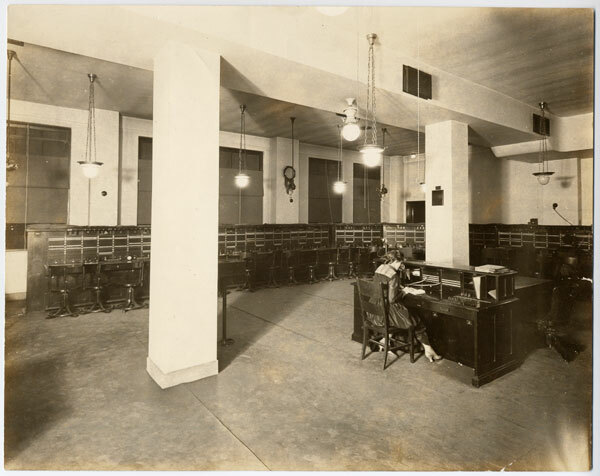 Description: Interior of telephone office showing a woman seated at a switchboard console. Keywords: Wichita, Business and industry, public services, people, employment. Description: Railroad station built on east Douglas in 1914 to replace a decrepit Santa Fe Depot. Located at the site of elevated tracks that had been erected over Douglas in 1911. 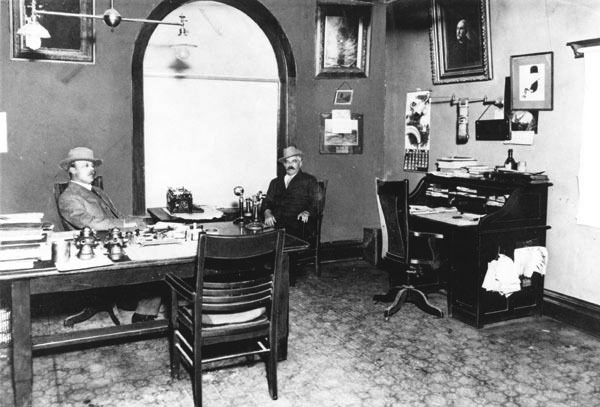 It housed a Fred Harvey restaurant and an imposing waiting room. Keywords: Business and industry, public services, street scenes, transportation, automobiles, architecture, Beaux Arts. Description: View of Engine House No. 2, 500 South Topeka Street. The building was located on the southeast corner of Topeka and Lewis streets. 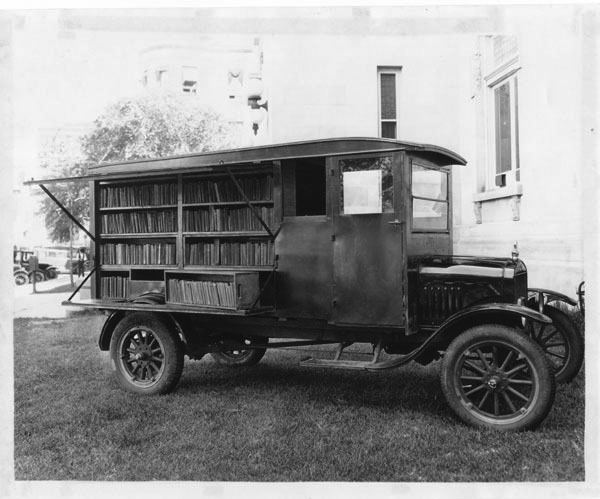 Photograph taken September 22, 1931. Description: Birdseye view looking northwest from the Broadview Hotel (101 North Waco). Site of the Ackerman Island removal project, which was funded by federal funds during the Great Depression. The island was removed and displaced as lines of workmen hauled soil from the island in wheelbarrows and dumped it as fill on the west bank of the river. The Civil Works Administration, one of Roosevelt’s New Deal programs, paid the men about $12.00 a week for 30 hours of work [Wichita Eagle, 11/21/1933]. Ackerman Island had been the site of Wonderland Amusement Park and a baseball stadium. 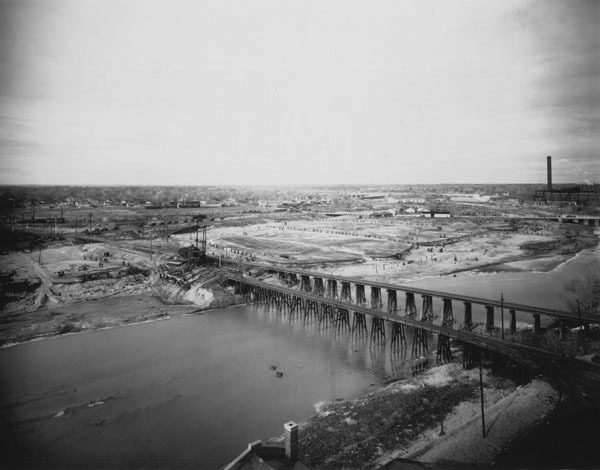 The bridges at center served the Missouri Pacific Railroad. The tall smokestack in the background was at the Kansas Gas and Electric Company plant. The Arkansas River winds northwesterly through the view. Keywords: Government, public services, rivers, transportation, landscape, skyline, West Wichita, Delano neighborhood, Wichita. Description: Looking south at Central Police Station, 109 East William Street. 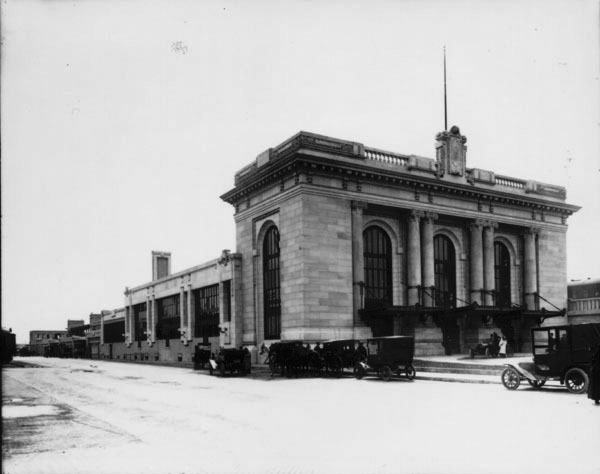 This building was the object of emergency relief funds and labor during the New Deal era of the Great Depression. 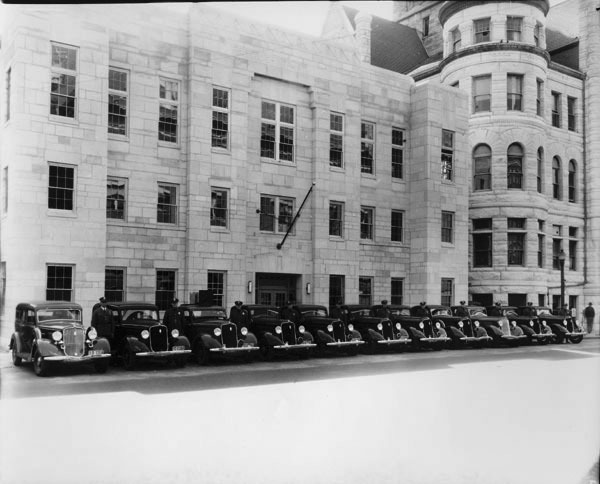 In 1933 Wichita received funds to convert the structure, which had been the Central Fire Station, into a “modern police station.” The building was remodeled and received a new Art Deco architectural style (compare to item wschm­_­N1-6.1.1 in this database). The Wichita City Hall, known as the City Building, is at right. Keywords: Government, public services, street scenes, transportation, automobiles, policemen, architecture.